Tips untuk Audit software dan aggrement nya..
Condensed aerosol fire suppression is a particle-based form of fire extinction similar to gaseous fire suppression or dry chemical fire extinction. The aerosol employs a fire extinguishing agent consisting of very fine solid particles and gaseous matter to extinguish fires. The condensed aerosol microparticles and effluent gases are generated by the exothermic reaction; until discharged from the device, the particles remain in vapor state. They are cooled and "condensed" within the device and discharged as solid particles. To the difference of gaseous suppressants, which emit only gas, and dry chemical suppression agents, which are powder-like particles of a large size (25-150 micrometres), condensed aerosols are defined by the National Fire Protection Association as releasing finely-divided solids of less than 10 micrometres in diameter. The solid particulates have a considerably smaller mass median aerodynamic diameter (MMAD) those of dry chemical suppression agents, remain airborne significantly longer, and leave much less residue within the protected area. Whereas dry chemical systems must be directly aimed at the flame, condensed aerosols are flooding agents and therefore effective regardless of the location and height of the fire. Wet chemical systems, such as the kind generally found in foam extinguishers, must, similarly to dry chemical systems, be sprayed directionally onto the fire. The condensed aerosol agent can be delivered by means of mechanical operation, electric operation, or combined electro-mechanical operation. 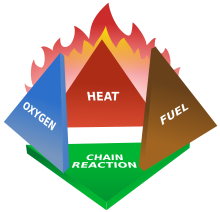 Condensed aerosols’ primary extinguishing mechanism involves the fourth element of the fire tetrahedron by means of chemical reactions with the free radicals of the flame, therefore interfering with the combustion process of the fire. Typically, condensed aerosol particulates consist of potassium carbonate (K2CO3)) that are produced from the thermal decomposition of a solid aerosol-forming compound that includes potassium nitrate as an oxidizer. As the aerosol particles surround and come into contact with the flame, the particulates absorb the flame heat energy, breaking down and releasing large concentrations of potassium radicals (K+) (ions with an unpaired electron). The potassium radicals bond with the hydroxide (OH+), hydrogen (H+) and oxygen (O+) free radicals which sustain flame's combustion process, producing harmless by-product molecules such as potassium hydroxide (KOH) and water (H2O). Flame is the gaseous part of a fire resulting from the combustion of fuel. Aerosols particles and gases mixing with the gaseous components of the flame isolate the fire's fuel. Attacking all the elements of the fire tetrahedron, condensed aerosol fire suppression agents are among the more effective flame-extinguishing agents. For example, some condensed aerosol fire suppressants can extinguish a Class B flammable liquid pool fire with 1/5th the amount of Halon 1301 agent or 1/10th the amount of a hydrofluorocarbon or fluoroketone based clean agent gaseous fire suppression system in terms of kilogram mass of agent per cubic meter. The extinguishing performance of condensed aerosol fire suppressants is dependent on the density of aerosol particulates in the immediate vicinity of the flame. As with gaseous fire suppression systems, the faster the agent can build around the flame, the more efficient the extinguishing agent will be in terminating the flame’s combustion process. The extinguishing and design densities of aerosol fire suppression agents are generally expressed in kilograms per cubic meter (kg/m^3). Thus, the efficiency of aerosol extinguishing agents varies depending on a number of factors, such as the location of the aerosol relative to the flame, the proximity of other combustible flammable materials, the type of fuel involved, etc. Condensed aerosol devices are designed to provide a controlled discharge. The aerosol-forming compound is installed inside of the device, which is then fitted with an electric or mechanical initiator. 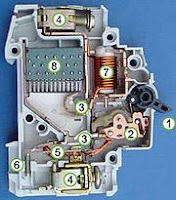 The electric initiator is interfaced with a fire detection control unit or panel, which can be remotely operated by physical means such as by cable, hand operated with a fuse mechanism such as those used in smoke dispensing grenades, or automatic and self-triggering when outfitted with an integral heat-sensing device. There are two uses for applying fire extinguishing agents: as a total flooding fire protection system or as a local application fire suppression system. To provide total flooding fire suppression, the total quantity of aerosol required to extinguish a fire inside of fixed space must be determined. The corresponding number of aerosol devices that would collectively discharge the aerosol quantity required are then mounted, typically on the ceiling or wall. Aerosol devices equipped with electric initiators are interconnected and relayed by a fire alarm control panel. Because the aerosol devices are self-contained and function as both a storage container and as a nozzle that propels the gas, no distribution network is required to transport or distribute the fire-extinguishing agent from a remote storage location, resulting in floor space savings and transportation efficiency gains. Local application fire suppression is typically applied by a handheld portable device tossed directly toward the fire. Unlike streaming portable fire extinguishing units, the operators are not required to place themselves at risk by approaching the fire while applying the extinguishing agent directly at the flames. The portable condensed aerosol device is typically designed to disperse aerosol in a 360° spray pattern, forming a large aerosol cloud around the vicinity of the fire. The aerosol immediately attacks the flames as its particles approach the fire and generate flame-neutralizing potassium radicals. The flames are suppressed as long as the aerosol retains sufficient density. If the aerosol fails to achieve sufficient density to extinguish the fire, it will still suppress the fire, which will retain significantly lower heat. This offers firefighters, for instance, a tool to bring down flames to a manageable heat level and reduce room temperatures while the hose team enters the burning area. As another example, First Responders can deploy condensed aerosols within an enclosed area to suppress fires while evacuating occupants to safety. Panel Listrik – Electrical switchboard atau lebih kita kenal dgn panel listrik terbentuk berdasarkan susunan komponen listrik yg sengaja disusun dalam sebuah papan control, sehingga dapat memudahkan penggunaanya. MCB, yg singkatan dari ( Miniature Circuit Board) merupakan komponen panel listrik yang berfungsi sebagai switch pembatas arus akibat dari kenaikan daya /tegangan yg melebihi batas dan atau hubung singkat. Komponen panel listrik ini biasanya terbatas pada arus nominal kecil sampai dgn kurang dari 100 Ampere. Bentuknya ada yg satu pole (satu input dan satu output), ada yg dua pole, tiga pole hingga empat pole. MCCB, MCCB singkatan dari Moulded Case Circuit Breaker. Circuit Breaker pembatas arus apabila terdapat arus beban yg melebihi batas-batasnya. MCCB ini dipakai hampir sama dgn MCB tetapi dgn batas arus beban yg lebih besar dari 100 Ampere sampai dgn 1600 Ampere. 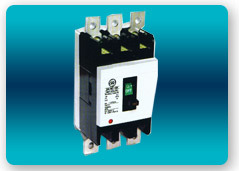 GFCI/ RCCB/ ELCB, Ground Foult Circuit Interruption ialah semacam Circuit Breaker yg bereaksi lebih cepat dari MCB. Komponen panel listrik ini akan memantau listrik lebih rinci dan jika terdapat short atau kabel terkelupas dan mengenai manusia, tidak mengakibatkan kematian. CT, CT merupakan suatu komponen panel listrik dari bahan baja / metal dalam bentuk lingkaran (ring) atau gelang persegi dan tengahnya berlubang. Fungsi dari komponen panel listrik ini yaitu sebagai penurun arus dan atau tegangan pada box panel . Panel ditribusi listrik adalah tempat menyalurkan energi listrik dari panel daya atau sumber listrik ke beban baik untuk instalasi tenaga maupun instalasi penerangan. The significant driver for today’s economy is the small, medium and micro-sized enterprises (SMMEs) in terms of development and innovation to the economic integration and competitiveness. “Start-ups” and “Young Entrepreneurs” gradually play more important role in this segment (2012 APEC Leaders' Declaration). The right information and communication technologies (ICT) help these small guys stay focused on their core competency in order to compete against big players. DrayTek hence launches SMEE Business Network Solutions to offer the state-of-the-art solutions at the affordable price for SMMEs. The dual WAN interface of the Vigor routers avoids the Internet connection downtime from one single Internet Service Provider (ISP). The Vigor routers offer WAN connection failover and load-balancing to ensure your organization to stay connected. The USB port acts as USB WAN for 3.5G/4G LTE mobile broadband, another practical way to backup the access. The Vigor routers can handle the Internet feed over 100Mbps for the bandwidth consumed cloud-based applications. This drives down the SMEEs’ initial investment and allows them to only adopt the thin client hardware for the better bottom line. DrayTek implements the advanced firewall features to ensure the network security. Business users can avoid the damage cost by outside attacks and internal inappropriate activities. The VPN feature can deliver the secure remote access for both site-to-site and client-site needs. In addition to the data exchange, the VoIP over VPN feature prevent the essential conversation from eavesdropping. DrayTek delivers the secure 802.11n Wi-Fi to satisfy BYOD demands. You can choose the access point to extending coverage for the better collaboration. The recommended Vigor routers all work with the Smart Monitor Traffic Analyzer to help the management team reduce employees’ time waste on unnecessary activities. The DrayTek SMEE Business Network Solutions provides advanced hardware and software product lineup to establish a secure and productive workplace with ease. Dual WAN and USB WAN (3.5G/4G LTE) ensure reliable connectivity. Your thin client PCs can run those mission-critical business applications offered by the Cloud. CSM (Content Security Management) enables users to control and manage IM (Instant Messenger) and P2P (Peer-to-Peer) applications more efficiently. Vigor solutions support both LAN-to-LAN (site-to-site) and Remote dial-in (client-to-site) in PPTP/L2TP/IPSec that helps tele-worker access corporate data/application in anytime/anywhere. No matter network logging record, e-mail record or IM chatting record, or file downloading, SIP call, VPN connection and more. “Timeline” feature gives you in-depth understanding how every employee spends the working hours in order to find way to enhance productivity. Collect and review all software acquisition records. Collect and review all software license agreements. Select a process or tool for the internal software review. Decide whether employees will be notified in advance. If employees are to be notified in advance, send an explanatory memorandum. If employees are not notified in advance, be respectful of employee property. It is always possible that you may find a program that does not belong to the company, but is an employee's legitimate property. Do not erase any software without first consulting the employee on whose PC the program is found. Determine who should be involved in the review. Suggestions: MIS Director, Senior Management/Staff Legal Counsel, Department Heads, Outside Legal Counsel/Auditor. If physically checking machines follow these procedures: Locate all personal computers, including portable computers. If the facility is large, mark locations on a floor plan. When a PC is not accessible, make a note to search the hard disk at a later time. Print a list of directories for each hard disk, determining if and how software are can be downloaded onto a hard disk from your local area networks. It may be necessary to search several drives, i.e., C, D, E, and F and subdirectories of each drive. Searching the directory on a Macintosh system may involve opening folders within other folders to find all applications. Programs will generally be identified using abbreviations like WP for WordPerfect, 123 for Lotus 1-2-3, SK for Sidekick, WS for WordStar, etc. Take an inventory of floppy disks and available documentation if software is not stored on hard disks. Compare software found on hard disks with acquisition records. Alternatively locate authorized disks and/or documentation for each software program listed on a hard disk. Review organizational policies on the use of software on home computers. Destroy any unauthorized copies of software and record work. List personnel who need to be supplied with genuine software. Publish corporate policy of software use, and request employee sign off. Document list of standardized software based on evaluation of software installed and communicate required software to be supported to helpdesk personnel. Document processes for storage of media, documentation and proof of license. Document products and processes for data storage, disaster recovery planning and testing, security against hackers, viruses, spam and spyware. Ensure you have the software installed on all your platforms (UNIX, Linux, MAC, etc) since some of the big ticket items are sitting on those. Note: It is very essential to remember and set aside the time for "normalizing" the data collected by any discovery tool to ensure accuracy and account for applications not recognized by the tool. This can be a very time consuming task and seeking expert assistance might make sense. To start with perform a Gap Analysis. Take a detailed look at your licensing status for various Software you use. This requires some form of software inventory tool to find out what is installed and usually involves some level of data cleansing to in order to build a clean inventory of installed assets. Collect anywhere up to six years worth of historical license records from the Sysadmin team and vendor, their contracts, purchase history and build a statement of entitlement. Subsequently provide a licensing status report. Check your pockets. Use data from the Gap Analysis and look at what the IT team is planning 3 to 6 years from now. Look at what projects you have on the horizon, the strategic plans and compare and contrast this to the vendors roadmap and upgrade plans. Ensure the relevant agreements are in place and look at the various options available to the IT admin. Finally look at the ramifications 3 to 6 years down the line for each agreement option. How it works out in terms of their projects, financials and their agreements. Finally begin to plan for the negotiation. This part is rarely performed before a negotiation - even when millions of dollars are at stake. There is no negotiation strategy. Work with the team to define the goals of the negotiation of the new contract. How much are you going to spend? What is your budget? Set out the differences between maintenance payments and new licenses and agree soft objectives such as support benefits, training vouchers and training. jetNEXUS ADC and load balancing solutions are available in a variety of formats to offer great flexibility for easy integration into client networks. This document is designed to help you decide which platform is best suited for your environment. A Hardware load balancer is a more traditional approach to load balancing. A hardware load balancer is an appliance platform meaning that it is a fully integrated solution - Software, custom OS and specialised hardware designed to reliably run together. A Hardware load balancer can be easily installed and removed from the network with no third party dependencies – Except the network! A virtual Load Balancer is based on the principle of virtualisation and, more specifically, virtual machines. A virtual machine is a self contained software product including an operating system and application designed to run in a virtual environment such as VMware or Microsoft Virtual Server. Traditionally virtual load balancers have not been able to perform as well as required, however, with significant improvements in virtualisation technology and hardware performance, this is no longer the case. Multiple jetNEXUS Virtual Appliances can be run across multiple virtual servers providing the same level of resilience as the hardware appliance. As the power capabilities of standard computing hardware has evolved, so has the development of load balancing software solutions that can be installed on standard hardware and Operating Systems. The jetNEXUS ISO software Load Balancer is a fully integrated solution complete with operating system and installer in one. This type of solution delivers maximum flexibility to users, enabling them to take the powerful architecture of a hardware solution and build onto almost any server hardware platform of their choice.